The Shaheed Girls Orphanage, located at Oleander Gardens, East Coast Demerara (ECD) was destroyed by a fire yesterday morning. Reports reaching this newspaper indicate that the top flat of the two-storey building became engulfed in flames shortly after 06:00 hours. The orphanage which is located at lots 7&8 Oleander Gardens, East Coast Demerara (ECD) was home to 17 girls and their 59-year-old caretaker Shantie Pooran, who has been employed at the said facility for the past seven years. The girls and their caretaker have since been moved to the Shaheed Boys’ Orphanage in Kitty. Ms Shantie Pooran stated that around 06:00hours yesterday, she was in the living room when she asked one of the girls to bring her medication for her; however the girl returned informing her there was smoke coming from her room. She said that it was then that she looked up and saw smoke coming from the prayer room. Immediately she indicated to the girl to get the others while she took off the main switch. Shantie Pooran said, “We ran out of the building in our sleeping clothes screaming and hollering for help but no one was able to come and help because the area is a residential area and no one wakes up that early. We didn’t even get to eat breakfast”. She added that when they got outside she saw the fire was actually coming from the garage area. She said that she did not know what would have caused the fire in there. An alarm was raised and the police and the fire service were summoned. When the team arrived the top flat was already destroyed by the fire and the blaze was creeping to the lower flat. 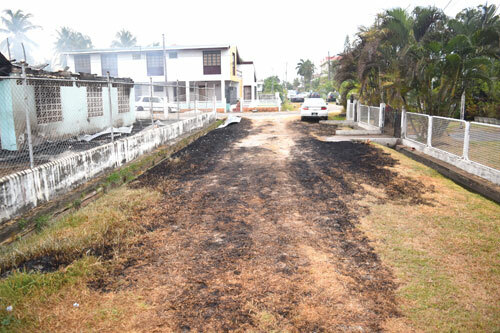 Even though the grass outside of the premises was scorched this newspaper learnt that no one was injured during the fire and no other buildings were damaged. Information was not disclosed as yet as to the cause of the fire, or the estimated cost of the damage. Shaheed Girls Orphanage is a Muslim orphanage established in the 1950’s. It is currently operated by Raheene Rahaman, a self employed person, 65, of lot 208 Republic Park East Bank Demerara (EBD). The institute provides care, home and other services for orphans, vulnerable and destitute children. The orphanage has gained support from successive governments and contributors over time. Police reports indicated that the two-storey building said to cost over $50 M, was not insured.